Wild Bill's Blog | ………………………All Weather…All the Time! Severe weather threat on the horizon for Tuesday. This is the Storm Prediction Center’s Day 2 outlook for tomorrow, Tuesday February 2, 2016. Sunday’s afternoon highs were plenty warm in the Southern United States to support a bout of spring-like severe storms in the dead of winter. The jet stream and surface features in almost perfect alignment for severe weather in the SPC’s outlook area. 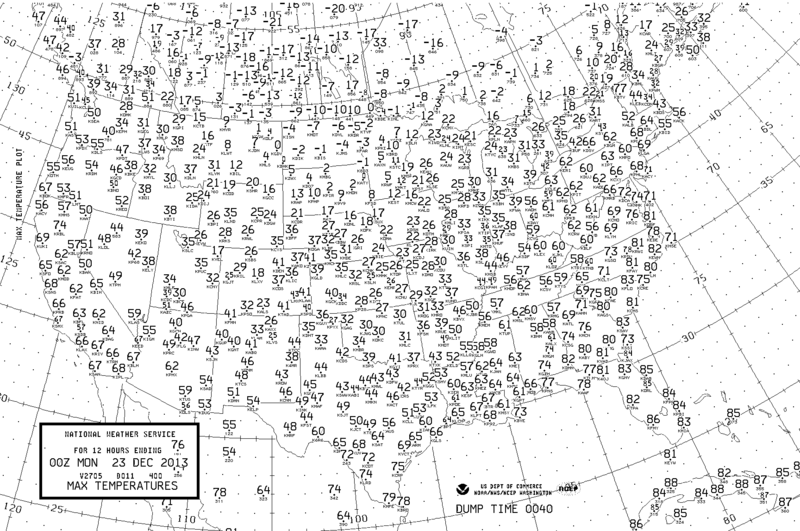 Below are 500mb and surface forecast for 21z Tuesday afternoon. with 12z February 05, 2008, the beginning of the Super Tuesday Outbreak that produced 87 tornadoes over two days killing 56. The features the two maps have in common would include the event driving deep upper low vicinity Colorado/New Mexico Border, the kicker, just west of the Pacific Northwest, the next disturbance in the series and the polar vortex well north over Hudson’s bay. So, heads up, weather folks are all bent out of shape about this one for a reason. If you do live in the yellow slight risk area, or orange enhanced region there is a real threat for damaging weather with the passage of this weather system. Southern California wind observations from Sunday January 31, 2016 showing the wind energy of our approaching weather system. Santa Barbara Island gusting to 79mph. San Clemente gusting to 56 mph. 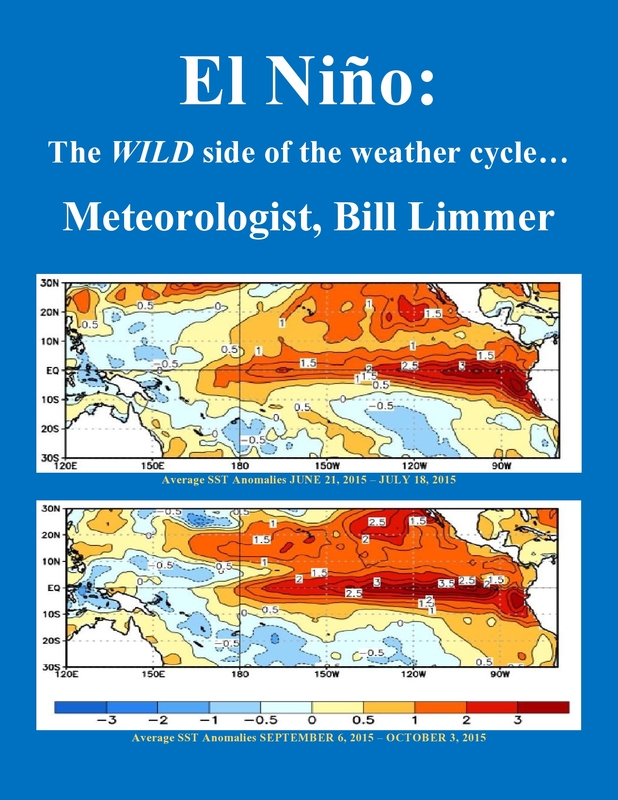 Floods, snowstorms, and tornadoes oddly enough are all in my latest e-book El Niño: The WILD side of the weather cycle…What we know, what we don’t, and WHY you should care! 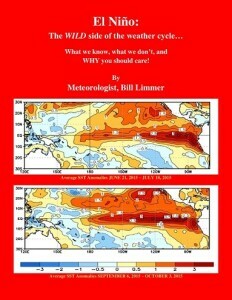 I show how this years Pacific water temperatures compare to the 1983 and 1998 events and highlight the kind of weather episodes that these stronger El Niño’s tend to bring. 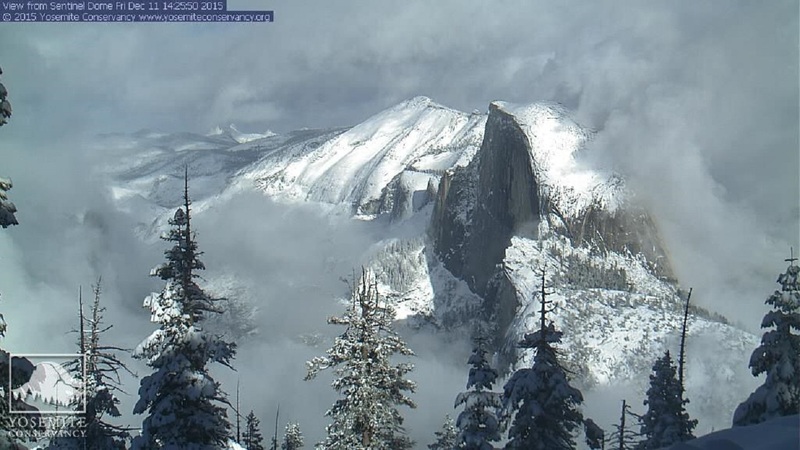 El Niño at work, increase in cloud over the High Sierra. Our El Niño winter has delivered an incredible snowstorm to Washington, Baltimore and New York City. January 24, 2016 snowstorm totals for selected Washington, Baltimore and New York locations. There are many different ways to report snow amounts. There are storm totals, calendar day amounts(Midnight to Midnight), and amounts in other 24 periods,(example, daily obs are 12z or 7amEST). So it can get a little confusing when determining what is an actual record and what is close to a record. For the Baltimore Airport and most of the New York City area these are indeed record amounts of snow. 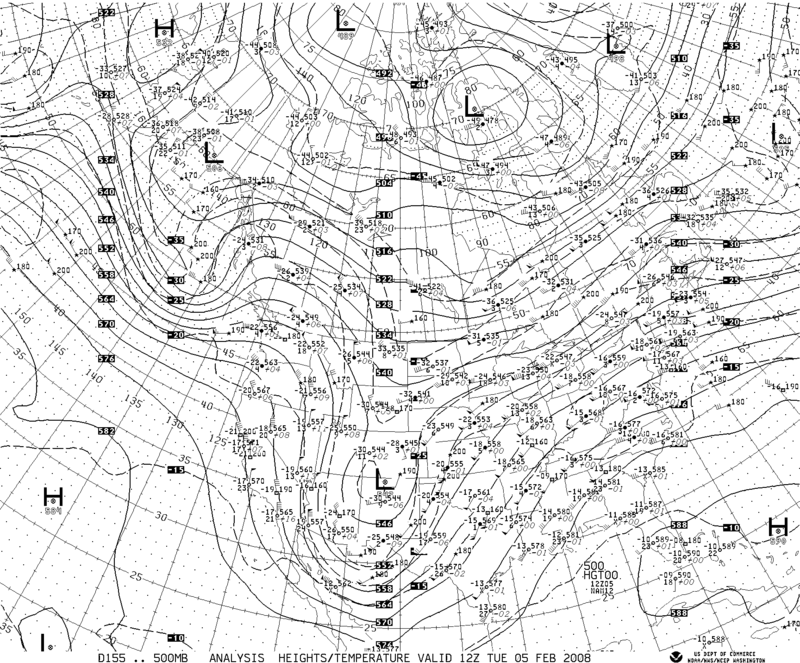 700mb charts below show the storm blossom and slide more east than north focusing the punch at the Mid-Atlantic. However mature circulation does manage to reach as far north as NYC area by Saturday morning the 23rd. 17th, …. 5 days before Blizzard subtropical plume from El Niño region already established. The plume reaches from the equatorial Pacific across Mexico and the Gulf Of Mexico into Georgia, Florida and the Southeast. 19th, … Disturbance over SE has moved away but the tropical plume remains. 22nd early, … new disturbance gaining strength while approaching but not yet directly connected to the plume. 23rd early, … and throws the moisture into below freezing air across Mid-Atlantic. Quite impressive, impressive enough to challenge all time snowfall records in several major East Coast cities. Below other El Niño related events in recent weeks, …. January 08, 2016 Bonnet Carre Spillway to open to divert water out of Mississippi River. What we know, what we don’t, and WHY you should care! I show how this years Pacific water temperatures compare to the 1982 and 1997 events and highlight the kind of weather episodes that these stronger El Niño’s tend to bring. December (12) 2015 is Another record warm month in the 3.4 Niño region. November and December of 2015 achieved the two highest monthly averages for the 3.4 Niño region since 1950 eclipsing the warmest months of both 1997 and 1982. Weekly SST comparison of this season to 1997 for the 3.4 Niño region since July. First number at months end represent three month or 13 week averages, Second column is an average of three consecutive sets of 13 week averages. These values are similar to values in the ERSSTv3b data set for determining the ONI. Evidence of El Niño at work in the Sierra Nevada. 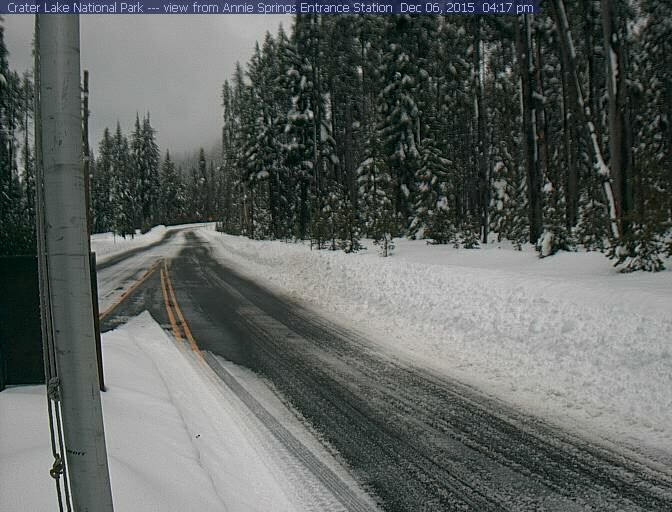 We may have just seen the first major storm in Southern California, but it has been snowing in the Cascades and Sierra Nevada for weeks now. 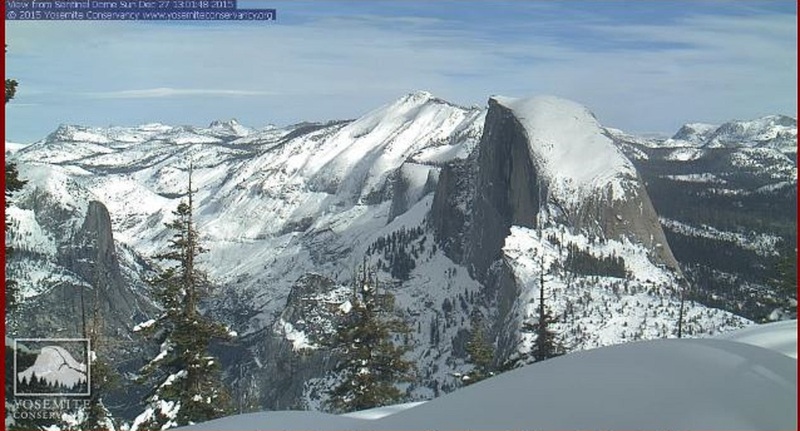 Visible evidence shows snow depths increasing above Yosemite Valley. Pictured in this late evening satellite image is the first two of perhaps four separate waves of moisture that will pass through South California between Monday and Friday. The waves, or periods of stormy weather will be Southern California’s first widespread significant rain of this El Niño season. Another image showing atmospheric moisture content also shows two narrow bands of tropical moisture feeding up from equatorial regions into the approaching storms. Also notice the fat ribbon of moisture from the Gulf of Mexico to Europe. While the U.S. endured record warmth, tornadoes and flooding for the Holidays, The British Isles were swamped by stormy weather as well. 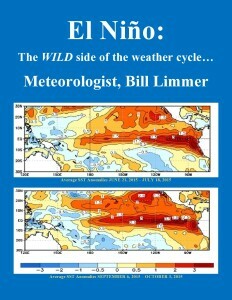 All signs El Niño continues to have a major influence on weather Worldwide. One last image to try and answer the question of why the Mighty Mississippi is in flood in January. The dark red over Central Missouri indicates up to 10 inches of rain over a 300 mile stretch from St. Louis to Joplin. 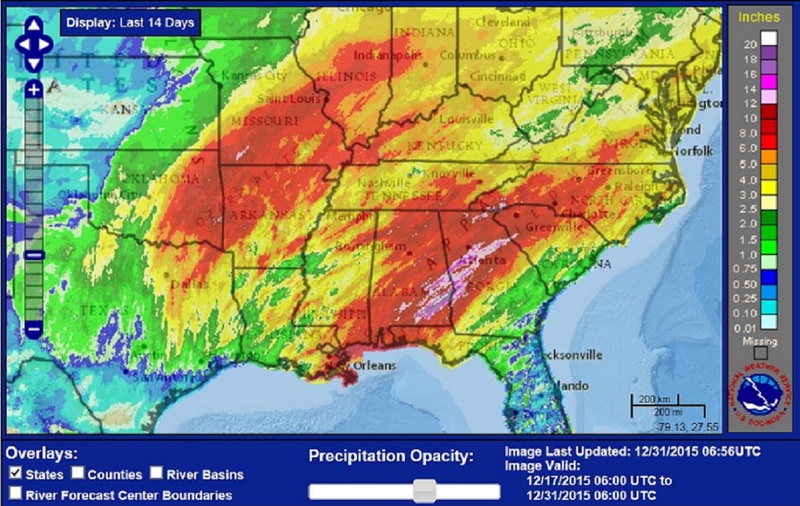 Most of that rain occurring in the last seven days. In coming days we will look at January’s cold turn in the East where record warmth ruled the Christmas Holiday. Below, a cloud covers the summit of Mt. 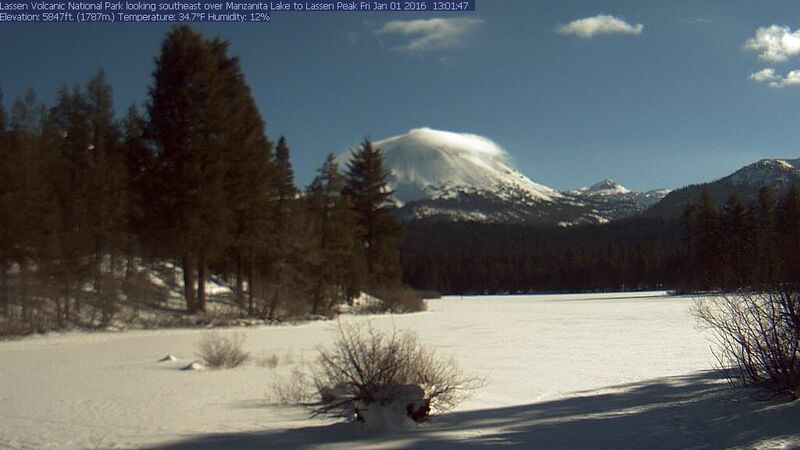 Lassen on the 1st day of the year. Finally some rain may be in the forecast for Southern California. After a record warm Christmas in New York, historic flooding in Missouri, deadly winter tornadoes, and a healthy snowfall in El Paso, it may finally rain in Los Angeles. The warm Christmas in NYC, the flooding in Missouri, and the Christmas week snow in El Paso all happened in the last few days AND are all repeats of events in December 1982. 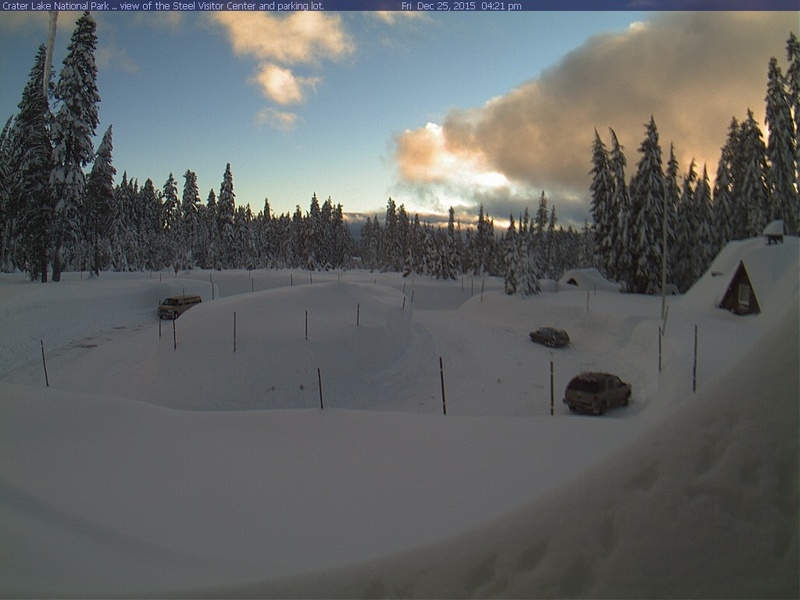 Parts of The Cascades are buried, 9 feet around Crater Lake. 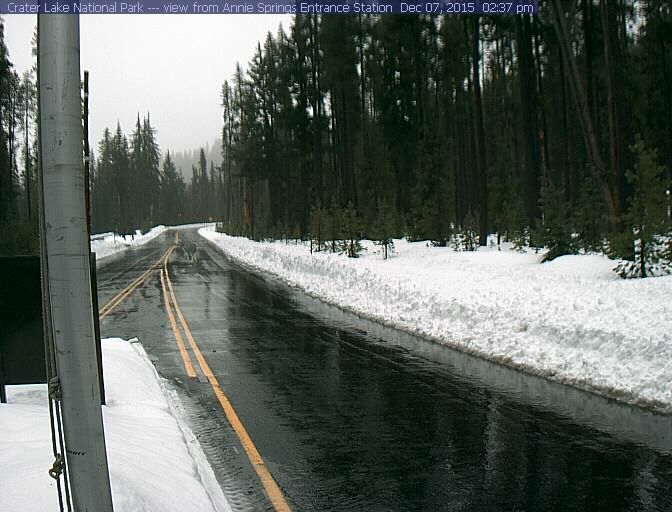 The Lake Tahoe area has seen feet of snow in recent weeks as has portions of the Northern and Central Sierra. The last piece of the puzzle is Southern California rain. Finally some rain may be in the forecast for Southern California. Two distinct short waves approach Southern California Sunday and Tuesday of the upcoming week. Forecast 500mb flow for midday Sunday January 03, 2016. Forecast 500mb flow for midday Tuesday January 05, 2016. Not just a warm Holiday for some in the East, but a record warm Christmas Holiday. This is just a sample of the hundreds of record high temperatures that have been set across the eastern half of the nation in recent weeks. Some locations like New York’s Central Park set a high temperature record on both Christmas Eve and Christmas Day. Albany New York was 15 degrees warmer than any other Christmas Eve on record and Burlington Vermont was 17 degrees warmer than the previous record. In places like Vermont, where a White Christmas is expected, temperatures nearly 40 degrees above normal are not only noticeable but crippling to the ski and winter industries. Ice and snow just don’t hold up to temps in the 60s and lower 70s. The unusually warm weather not only set records, but also set the stage for several rounds of deadly severe weather. Several fatalities occurred across Mississippi and Tennessee from a long track EF-3 tornado on Wednesday the 23rd. An EF-2 tornado struck a Birmingham suburb on Christmas Day. Damage was significant but no fatalities occurred. A new storm system on the 26th was still able to take advantage of the unusually warm weather. An EF-4 steamrolled the Dallas suburb of Garland killing eight in the early evening hours. December 23, 2015, …10 fatalities were reported in Mississippi, six were killed in Tennessee. One tornado producing thunderstorm tracked 145 miles from the Mississippi River across the state and into Tennessee killing 7. Other fatalities occurred due to tornadoes, straight-lines winds and flooding. December 25, 2015, … EF-2 tornado swirled across portions of McCalla and Bessemer Alabama, immediate suburbs of Birmingham, collapsing houses but not killing anyone. December 26, 2015, …11 died in Texas after several tornadoes were reported in the Dallas area. In Garland, a suburb of Dallas, eight people died Saturday from an EF-4 tornado, three others died in Collin County just to the north. In contrast, the Cascades of Oregon looked quite wintry on the Holiday. Below are images from last Christmas, this Christmas and June 1st. The Steel Visitors Center Crater at Lake National Park on Christmas Day 2014. The Steel Visitors Center Crater at Lake National Park on Christmas Day 2015. 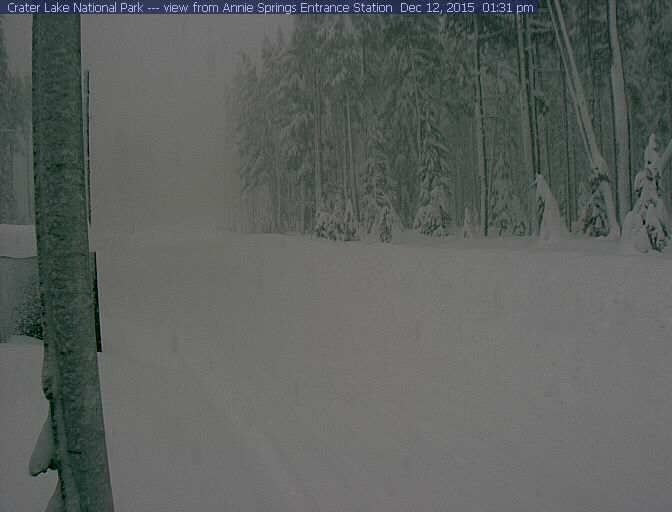 At 7050 feet the snow depth listed for Christmas Day 2015 was 111 inches, or a little over 9 feet. That is a full size van parked back left and the snow banks are well above. 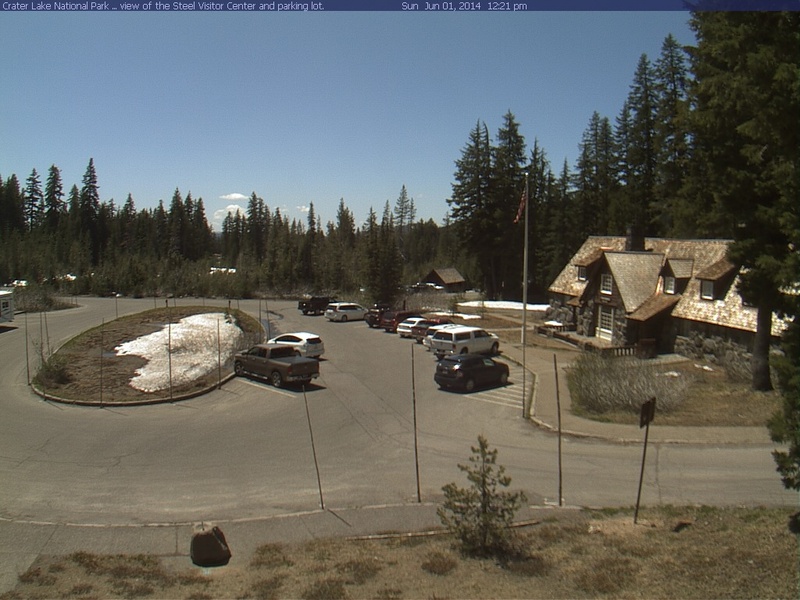 The Steel Visitors Center Crater at Lake National Park on June 01, 2014. Even in a drought year the snow cover lingers until June. Just to show anyway you look at it, Crater Lake was buried for this Holiday. 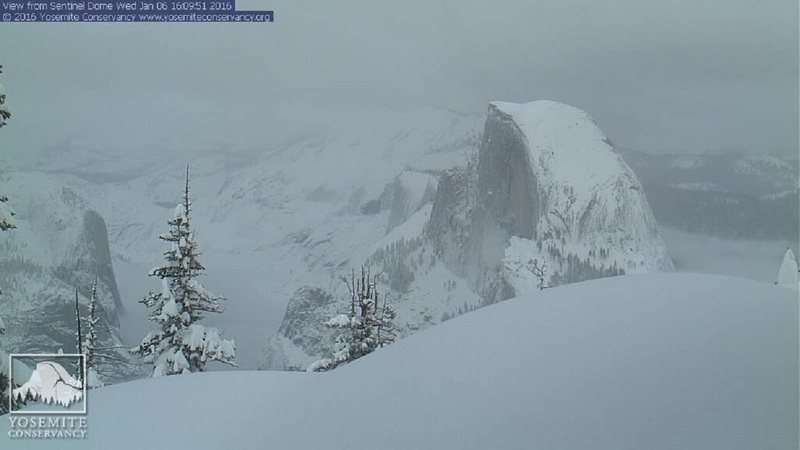 A series of West Coast storms have left there mark on the mountains of the West. Warm in the days before Christmas for a third year. It looks like warm weather across the parts of the East in the days before Christmas for the third year in a row. Maximum temperatures December 24, 2014, … not as warm as 2013, but well above freezing. 60 at Pittsburgh however, is only 2 cooler than its 2013 reading. Forecast for this December 23, 2015 also looks quite warm. The forecast for Pittsburgh is for a daytime high near 60. This will make three years in a row Pittsburgh will have been near 60 degrees in the days before Christmas. Normal high for December 23 for Pittsburgh is 37, making a high of 60, 23 degrees above normal. Well below normal temperatures were experienced in Pittsburgh on December 22, 1989 when the high was only 7 above, and December 25, 1983 the high for Pittsburgh was zero. So do not move to Pittsburgh and expect 60 degree pre-Christmas weather every year, but right now it certainly is in the forecast again this year, for the third year in a row. Red lines in the image above relate to above freezing temperatures. Note no blue line anywhere near Pennsylvania on this Dec. 23. How are today’s kids suppose to relate to “A Charles Brown Christmas” when there is no ice on the ponds and no snow on the ground for the third year in a row. 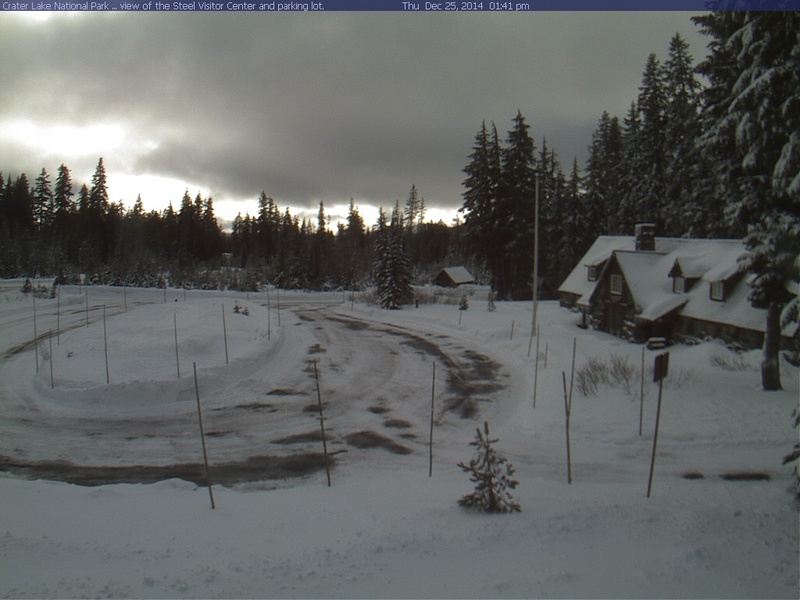 Various conditions at the entrance to Crater Lake National Park at times during the past week. Above recent heavy snow with temperatures slight above freezing, below rain and 42. Finally colder, slightly below freezing air, several days later and the snow depth doubles from 21 to 42 inches. 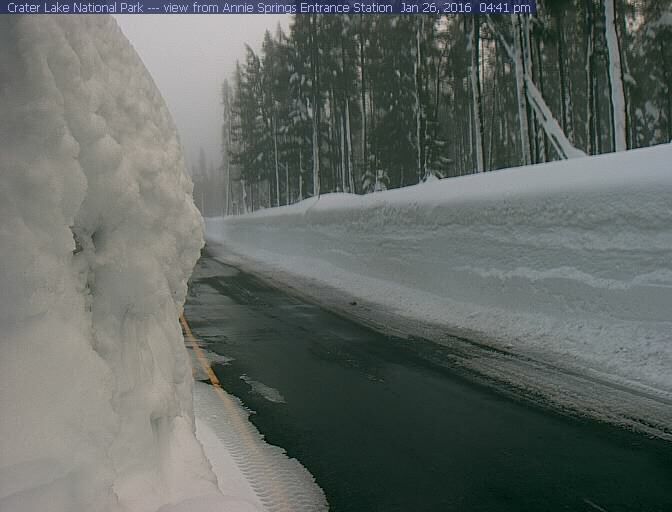 So what you cannot see is nearly four feet of snow on the ground at the lowest elevation in Crater Lake National Park. All the above quite the contrast to a record warm weekend. 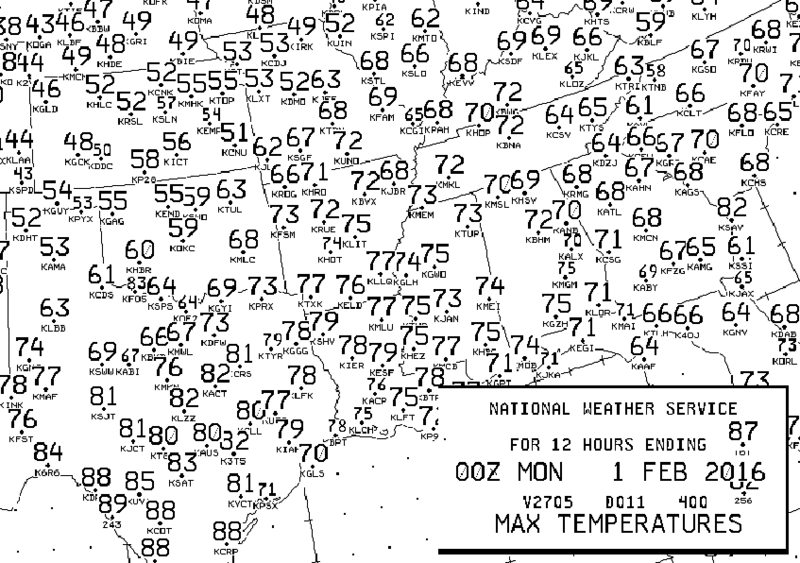 Sunday was the second weekend day of records highs in mid December over parts of the eastern half of the nation. We were very lucky there was not more serious severe weather this past weekend. Record warm mid December temperatures and a favorable 500mb flow for severe weather were both present this weekend in the middle of the country. Map on the left from this Sunday evening 00z the 14th, in the blue on the right, Sunday morning November 22, 1992, the middle of a 3 day tornado outbreak. 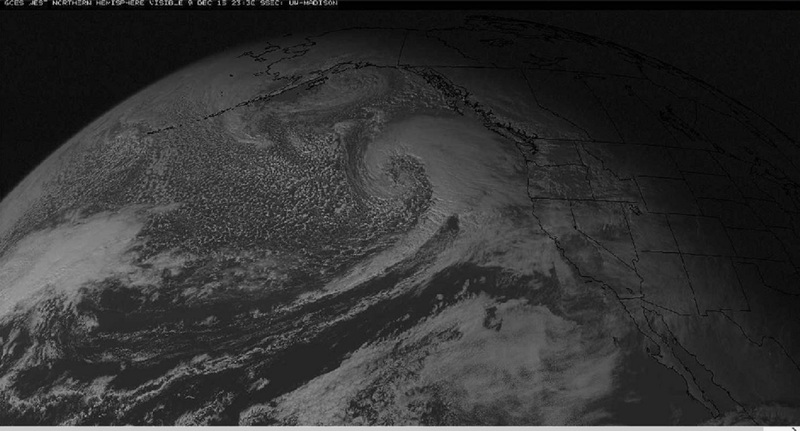 New storm spreads threats south into California. Below one of the last visible pictures of the day showing the next system approaching. Below are some rather strong statements from the NWS late Wednesday concerning various Marine threats as far south as Ventura County in Southern California. Sounds more like an El Niño season for Southern California, but this is not the big wet pattern that is highly anticipated for LA and San Diego, just a passing wave. The hope of course, in time, more waves and a jet stream a little farther south and an active winter is in business. TO STAY CLEAR OF THESE HARBOR ENTRANCES. * IMPACTS…THE CENTRAL COAST COULD SEE SURF FROM 16 TO 22 FEET. POTENTIAL FOR MINOR FLOODING IN AND AROUND BEACH AREAS. Below, image showing trail of water vapor across Pacific into the West Coast. Another trail of moisture stretches from the Caribbean across the Atlantic to the British Isles. Both areas have seen flooding rains in recent days. 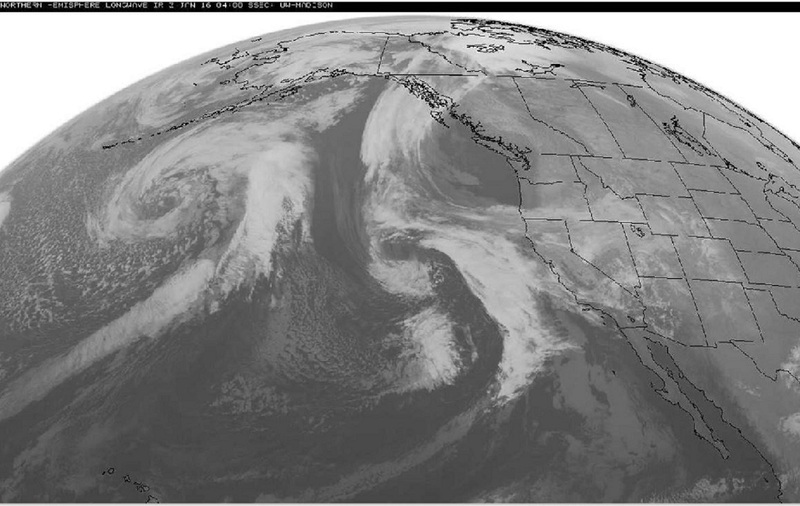 Standard full disk IR showing Pacific system racing toward West Coast. But also shows our El Niño region feeding clouds across Mexico and into the Atlantic. Here is a rare look at simultaneous full disk images showing a trail of clouds from the tropical Pacific all the way to Europe. Between our Pacific Northwest and the British Isles I would not think England would see the more serious flood because of excess El Niño moisture. But these current images tell a clear story. West Coast flooding could be a worse if there were a direct link to the El Niño region of the Pacific. All this active West Coast weather is not only finally going to bring some increment weather to Southern California. But will push east into the United States and bring many a stormy weekend. More on all that in the next day or two. Think ahead, stay safe.